NASA astronaut and International Space Station Commander Doug Wheelock became the first person to "check in" from space Friday using the mobile social networking application Foursquare. Wheelock's check in to the space station launches a partnership between NASA and Foursquare to connect its users to the space agency, enabling them to explore the universe and discover Earth. The partnership also features a customized section of the Foursquare website for NASA, where the agency will provide official tips and information about the nation's space program in locations throughout the United States. The deadline is fast-approaching for undergraduate students to submit their team proposals to NASA's Reduced Gravity Education Flight Program. Proposals must be received by 11:59 p.m. CDT, Wednesday, Oct. 27. NASA's Reduced Gravity Education Flight Program gives aspiring explorers a chance to propose, design and fabricate a reduced gravity experiment. Selected teams will get to test and evaluate their experiment aboard a modified Boeing 727 jetliner provided by the Zero-Gravity Corporation of Las Vegas. Zero-Gravity Corp. will conduct the flights in cooperation with the Reduced Gravity Office at NASA's Johnson Space Center in Houston. NASA has established a global forum for organizations interested in advancing human health and performance innovations in space and on Earth. NASA's Human Health and Performance Center (NHHPC) will give members an opportunity to collaborate, network and share information. NHHPC members include NASA centers and partners, industry, academic institutions, government agencies and nonprofit organizations. 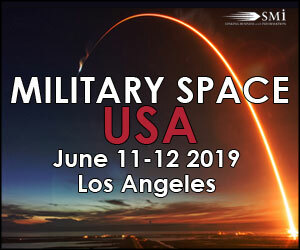 Members will work together to advance human health and performance innovations for spaceflight, commercial aviation and any challenging environment on Earth. Entering operational service in 1962, Titan I was the United States' first multistage ICBM (Intercontinental Ballistic Missile). 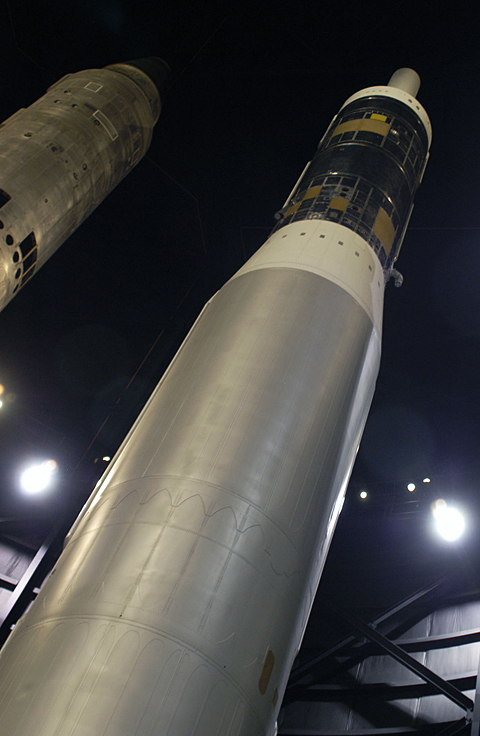 Incorporating the latest design technology, Titan provided an additional nuclear deterrent to complement the U.S. Air Force's Atlas missile. Though the SM-68A was operational for only three years, it was an important step in building the Air Force's strategic nuclear forces. Tomorrow, a NASA-sponsored Field Training and Research Program begins at Meteor Crater, Arizona. The field training will be led by Dr. David Kring, a geologist and Senior Staff Scientist at the Lunar and Planetary Institute in Houston, Texas. Twenty-four Ph.D. and Master's degree-seeking students from across the U.S., and the world, have been selected to be a part of this week-long training program beginning October 16 and ending October 24, 2010. Students will be trained on how craters on Earth and the Moon form, which should better prepare them in impact-cratered terrain, whether on Earth, the Moon, Mars, or some other solar system planetary surface. NASA and Harvard University have established the NASA Tournament Lab (NTL), which will enable software developers to compete with each other to create the best computer code for NASA systems. The NTL provides an online virtual facility for NASA researchers with a computational or complex data processing challenge to "order" a solution, just like they would order laboratory tests or supplies. Software developers will compete with each other to create a winning solution, as measured by internal code quality, performance against benchmarks, and the ability to be integrated into NASA systems. The competition will provide the researchers with a finished software solution at a lower cost than if they hired an individual developer or team. "NASA is at the forefront of this cutting edge approach," said Jason Crusan, chief technologist for space operations at NASA Headquarters in Washington. 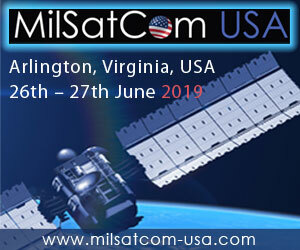 "We want to advance knowledge of how to manage these tournaments and gain solutions to technical mission requirements with real world results for operational and future programs." This approach, often termed "crowd sourcing" or "broadcast search," lessens the effects of uncertainty in software development by searching for a problem's solution through multiple, parallel paths. Instead of relying on one individual or team, the researcher can access many, independent ideas, which increases the chances of a successful solution. NASA and Etsy, an online marketplace for handmade arts and crafts, have partnered to launch "Space Craft," a contest where entrants share an original handmade item or work of art inspired by NASA and NASA's programs, such as the Space Shuttle Program and human spaceflight, aeronautics, science and exploration of the universe. Contestants can enter two-dimensional original art (painting, drawing, prints, mixed media, photographic, and computer generated prints). Three-dimensional entries, including wearable art and soft sculptures, also may be entered. The contestants will compete for one grand prize and three best-in-category prizes. The contest's grand prizewinner will receive a $500 Etsy-funded shopping spree. Etsy also will pay the winner's way to attend the space shuttle launch targeted for February 2011. NASA's goal is to help inform Etsy's 5.5 million members, 96 percent of whom are women, most under age 35, about the agency's present and future exploration plans. NASA and Gowalla, a mobile and web service, have partnered to bring users one small step closer to the universe. The partnership populates Gowalla with NASA-related information and four virtual items -- moon rocks, a NASA patch, a spacesuit and a space shuttle -- that can be found at agency-related venues. "Video from a camera attached to a weather balloon that rose into the upper stratosphere and recorded the blackness of space. Seven-year-old Max Geissbuhler and his dad Luke Geissbuhler dreamed of visiting space. Armed with just a weather balloon, a video camera, and an iPhone, they basically did just that. The father-and-son team from Brooklyn managed to send their homemade spacecraft up nearly 19 miles, high into the stratosphere, bringing back perhaps the most impressive amateur space footage ever. The duo housed the video camera, iPhone, and GPS equipment in a specially designed insulated casing, along with some hand-warmers and a note from Max requesting its safe return from whomever may find it after making it back to solid ground. All told, father and son spent eight months preparing for their homemade journey into space, in hopes of filming "the blackness beyond our earth." 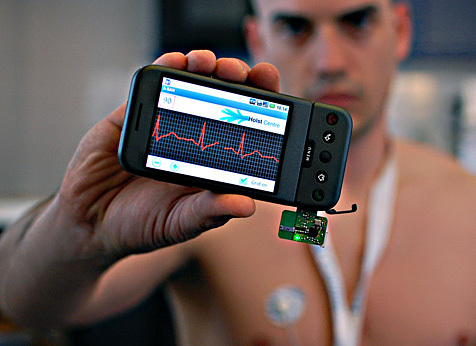 Image: ECG signals wirelessly transmitted to an Android mobile phone via a low-power interface. Click on the picture to download the high-res version. Imec and Holst Centre, together with TASS software professionals have developed a mobile heart monitoring system that allows to view your electrocardiogram on an Android mobile phone. The innovation is a low-power interface that transmits signals from a wireless ECG (electrocardiogram or heart monitoring)-sensor system to an android mobile phone. With this interface, imec, Holst Centre and TASS are the first to demonstrate a complete Body Area Network (BAN) connected to a mobile phone enabling reliable long-term ambulatory monitoring of various health parameters such as cardiac performance (ECG), brain activity (EEG), muscle activity (EMG), etc. The system will be demonstrated at the Wireless Health Conference in San Diego (US, October 5-7). 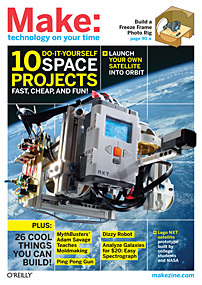 MAKE blasts into orbit and beyond with our DIY SPACE issue. Put your own satellite in orbit, launch a stratosphere balloon probe, and analyze galaxies for $20 with an easy spectrograph! We talk to the rocket mavericks reinventing the space industry, and renegade NASA hackers making smartphone robots and Lego satellites. Of course, as usual, we've got a full payload of other cool DIY projects, from a helium-balloon camera that's better than Google Earth, to an electromagnetic levitator that shoots aluminum rings, to a simple stroboscope that takes the most amazing freeze-frame photos. Plus: party-pleasing automated photo booth that prints out photo strips, MythBusters' Adam Savage teaches you hard-shell moldmaking, and much more. MAKE Volume 24, on sale October 26. - Weather Balloon Space Probes by John Baichtal - Sense, signal and snap photos in the stratosphere. Community college students in a pilot program will take the first steps toward potential technology careers as they develop robotic explorers at NASA field centers. Ninety students from community colleges in 23 states have been selected to travel to NASA's Johnson Space Center in Houston or the Marshall Space Flight Center in Huntsville, Ala., for hands on experience with technology development and direct interaction with NASA experts. This week, the White House Summit on Community Colleges explored how these institutions can support a highly educated and skilled workforce. Concurrently, NASA is preparing for the culmination of the National Community College Aerospace Scholars pilot program. The agency will bring young scholars to join agency professionals Oct. 20-22 to develop rovers to explore the surfaces of other worlds and learn more about actual careers in science and engineering. University of Illinois chemistry professor Alexander Scheeline wants to see high school students using their cell phones in class. Not for texting or surfing the Web, but as an analytical chemistry instrument. A few basic, inexpensive components and a cellular pone are all high school students need to build a spectrometer, a widely used analytical chemistry instrument. 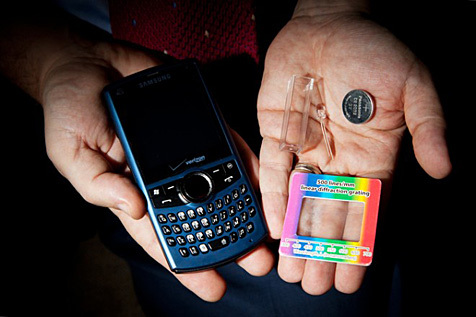 Scheeline developed a method using a few basic, inexpensive supplies and a digital camera to build a spectrometer, an important basic chemistry instrument. Spectrophotometry is one of the most widely used means for identifying and quantifying materials in both physical and biological sciences. "If we want to measure the amount of protein in meat, or water in grain, or iron in blood, it's done by spectrophotometry," Scheeline said. 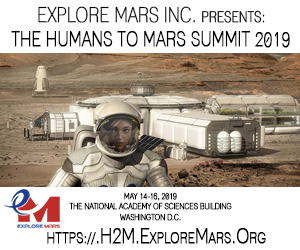 NASA and the Massachusetts Institute of Technology (MIT) in Cambridge, Mass., have selected 24 high schools to participate in a new science, technology, engineering, and math education program. The teams will design software to program small satellites aboard the International Space Station. The Synchronized Position Hold, Engage, and Reorient Experimental Satellites, or SPHERES, are three volley ball-sized spherical satellites that fly inside the space station's cabin to test advanced maneuvers for spacecraft, like formation flying and autonomous rendezvous and docking. Each contains its own power, propulsion, computing, and navigation equipment.